Cheim & Read is pleased to present Louise Bourgeois: Holograms, the first exhibition devoted exclusively to this little-known aspect of the artist’s long, groundbreaking career. In 1998 Bourgeois was approached by C-Project, a New York-based fine arts holographic studio (the C stands for the speed of light) dedicated to exploring the creative potential of three-dimensional photographs through the talents of top-flight painters and sculptors. The plates from Bourgeois’ resulting suite of eight holograms will be on display at the gallery from January 5 to February 11, 2017. The dream imagery conjured by Bourgeois for this new art form is in keeping with the probing psychodynamics of her widely admired sculptures, drawings, and prints, but the intimate confines of the hologram seem to have tapped into a particular strain of theatrical freedom. Within these self-contained universes, each measuring approximately 11 x 14 inches, she pieced together a cast of motley, emotionally resonate entities—miniature chairs, a bell jar, a pair of lovers (indicated by disembodied feet on a doll-house-size bed)—that combine the incipient dread and satirical playfulness that marks much of her work. The holographic image is created by laser beams that record the light field reflected from an object, burning it onto a plate of glass. The image is scaled at a one-to-one correspondence with the original material, so that peering at these works conveys the sensation of looking at an actual assemblage by Bourgeois, but at an eerie remove. 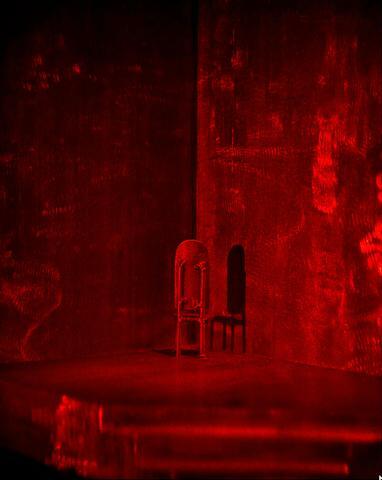 One of the most striking aspects of these works is their color, a saturated red that recalls the illumination of an old-fashioned darkroom. While it fits the content perfectly, Bourgeois’ use of this shade of red is actually the result of a materials-based decision. Holograms are glass plates that appear black until they come to life when struck by light at a particular angle. Depending on the way the glass plate is originally encoded, the hologram will have a base color of red or blue. The master plates for Bourgeois’ editions are red, and it was her intention not to tamper with the purity of the diffracted light carrying the image to the viewer’s eye. The dazzling clarity inherent to the process, which allows for close scrutiny of such details as the threads dangling from the bottoms of chairs and the light reflected off the surface of the bell jar, elicits both childlike wonderment and a Beckettian sense of slapstick horror. Louise Bourgeois was born in Paris in 1911 and lived in New York from 1938 until her death in 2010. She was named Officer of the Order of Arts and Letters by the French minister of culture in 1983. Other honors included the Grand Prix National de Sculpture from the French government in 1991; the National Medal of Arts, presented to her by President Bill Clinton in 1997; the first lifetime achievement award from the International Sculpture Center in Washington D.C.; and election as a fellow of the American Academy of Arts and Sciences. In 1993 she was chosen to represent the United States at the Venice Biennale. Her work appears in the most important museum collections worldwide and has been the subject of several major traveling retrospectives organized by the Tate Modern, London; Centre Georges Pompidou, Paris; The Brooklyn Museum; and The Kunstverein, Frankfurt.